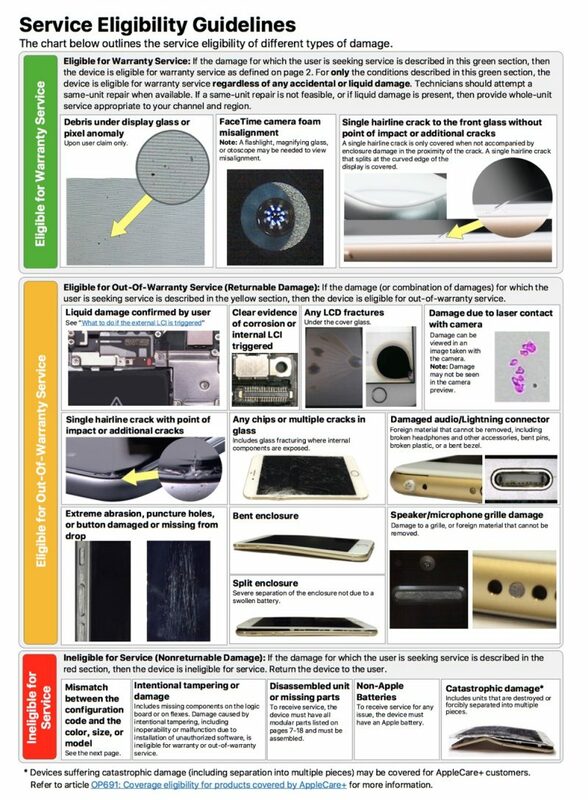 A leaked Apple "Visual/Mechanical Inspection Guide" shared this afternoon by Business Insider provides some insight into how Apple's repair policies work, highlighting how Apple determines when to offer an in-warranty repair, an out-of-warranty repair, or a denial of service. Dated March 3, 2017, the document is known internally as the "VMI" and covers the iPhone 6, 6s, and 7, along with Plus models. An Apple technician told Business Insider that there's a similar document for all of its products, and that it's generally used for training. The guide is divided into three sections. 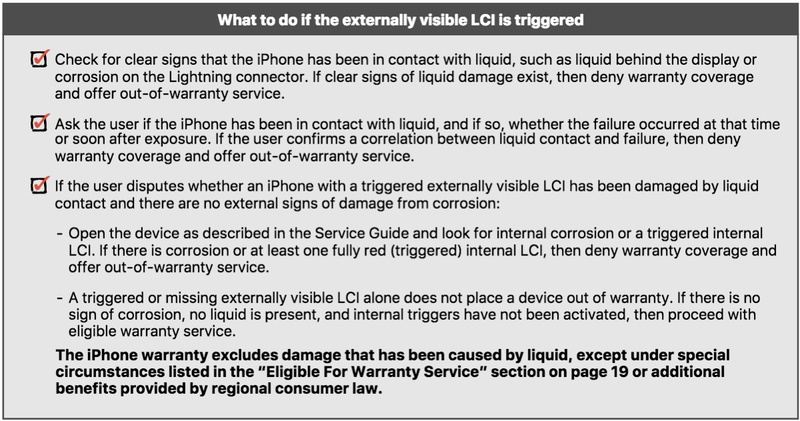 The green section denotes problems where Apple will provide a warranty service, the yellow covers issues where Apple will offer out-of-warranty repairs, and the red section contains examples of issues Apple will refuse to fix. Debris under the display glass, a pixel anomaly, FaceTime camera foam misalignment, and a single hairline crack to the front glass are all problems that Apple will fix under warranty, even if there's additional accidental or liquid damage to the device. These are the only issues that can be fixed automatically even with additional damage to a device. Apple will provide out-of-warranty replacements for liquid damage confirmed by the user, evidence of corrosion, LCD fractures, camera damage from lasers, cracks at a point of impact, damaged Lightning/audio/microphone components, extreme abrasion or puncture holes, and a bent or split enclosure. Devices that have user-replaced parts, intentional tampering or damage, non-Apple batteries, or catastrophic damage are not eligible for service at all. Enclosure damage, like scratches and scuffs, is not covered and cosmetic problems do not warrant a replacement or repair if there are no other issues. Apple also has a special set of rules for water damage. Employees are instructed to look for signs of water damage both internally and externally when diagnosing issues, and if there is evidence of contact with water, employees are told to deny some in-warranty repairs and instead offer an out-of-warranty repair. According to Apple employees, the VMI isn't often used unless there's an "oddball issue," and it's also more of a guide than a hard and fast rule when it comes to replacement, as there are many issues that arise that aren't covered here. "There are always those one-off issues that the phone is technically not covered under warranty but we swap the phone anyways under warranty," an Apple technician told Business Insider. These rules don't apply to devices covered by AppleCare+, as that warranty entitles users to two device replacements or repairs, even for accidental damage, so long as the fee is covered. For out-of-warranty repairs, Apple charges $130 to $150 for screen repairs and $300 to $350 for other damage. With AppleCare+, a screen repair costs $29 and other damage costs $99 to fix. My sense is that Apple uses this as a guideline, but tends more often than not to honor fixes under warrenty that could arguably not qualify if you went with this document as strictly as possible. All in all, when it comes to covering fixes, Apple tends to be one of the best in the business. its really interesting to see this. it confirms that apple is really doing a great job of trying to accept repairs in a fair manner. Not an earth-shattering leak. :) This is a standard issue document (also called 'Visual/Mechanical Inspection (VMI)), available to download from Apple's online portal (GSX) for all Apple Technicians / Authorized Service Centers. Source: responsible partly for putting the guide together. I was a Mac Genius for 7 years until '14. We never used the VMI much, veterans could do it by eye. Apple denied a 30 pin connector repair for my 4S because the LCI was red. They told me I submerged it which I didn't and wouldn't even schedule me in the Genius Bar. I got it working again by cleaning the connector. The false LCI was because I would go in and out of a cold environment and condensation would form on the stickers. The phone lasted me another 2 years and sold as a good phone. Rejecting service for non apple battery could get them in a little trouble in countries with strong consumer&/competition laws (AU, NZ). Otherwise everything else is what one should expect. My 6 has this, and I always suspected if I complained about it Apple might fix it--looks like I was right. Since it's entirely cosmetic, and barely even that, I never bothered, though--seemed pointless to mess with unless I needed to have it serviced for some other issue. Not really, actually they have a very controlled supply chain. They now will work on a modified iPhone so long as it is only the display that is third-party. Batteries require different safety concerns and tests. In fact, thanks to issues like Samsung’s explosive batteries, now everything regarding parts with battery require ground transport only. Interesting. Apple seems to be more than willing to be understanding when taking in a device for repair. At least here in the US. Stupid question, but what is an LCI? Liquid Contact Indicator. Which they won’t be tripped due to “humid environments”.